2010 was a pretty good year for Steam, which is estimated to have brought in nearly $1 billion in sales over the course of the year. Blizzard is the obvious poster boy for game companies that bring in truckloads of green by catering to the Clan of the Keyboard, what with all that World of Warcraft business it's got going on, but it turns out that Valve is doing pretty well for itself in that regard too. It may not put out a lot of games but according to analyst firm Forecasting and Analyzing Digital Entertainment, its digital distribution platform sure does pull in a lot of money. FADE estimates that Steam earned roughly $970 million in sales in 2010, including $213 million in December alone. 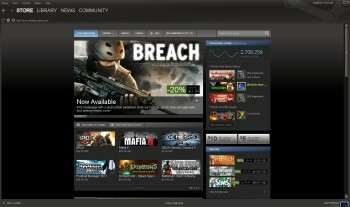 Valve was the third-largest publisher on the platform, primarily thanks to the 2009 release Left 4 Dead 2, but Steam proved a very valuable distribution platform for a large number of companies. "Steam's growth has been remarkable during the year," said Benjamin Schlichter, director of research and analysis at FADE. "Over 180 titles were estimated reaching over $1 million USD in revenue for the year, painting a very healthy market for developers and publishers, with more room for growth in the future." Unsurprisingly, Call of Duty: Black Ops and Modern Warfare 2 led the way, earning a combined $137.6 million for the year. Black Ops alone sold an estimated 1.6 million copies on Steam, just missing the $100 million mark despite being out for less than two months. Not bad for a dying platform, eh?